Home » Climate Change » Is ‘Nemo’ Endangered? 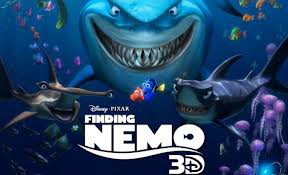 This September, Nemo, Dory, Marlin, and the rest of the animated cast of Finding Nemo are splashing back into theatres in 3-D. Finding Nemo has lost little of its original appeal since winning the 2003 Academy Award for Best Animated Film. Stunning visual effects, charm, and humor seamlessly weave ocean science into a universal story of family and friendship. Of course, ocean science has inspired many movies–The Abyss, Deep Blue Sea, The Day After Tomorrow, Avatar, and Happy Feet–but rarely does filmmaking inspire scientific discoveries. Nemo and his friends encounter exploitation (via fishing, harvesting, or trade) more than any other threat, followed by climate change and habitat loss. Consequently, sea turtles, mackerel and hammerhead sharks, eagle rays, and seahorses are swimming for their lives.3 The false clownfish and regal tang (Nemo and Dory) are among the 81% of species in this study drifting along without an International Union for Conservation of Nature (IUCN) extinction risk assessment. 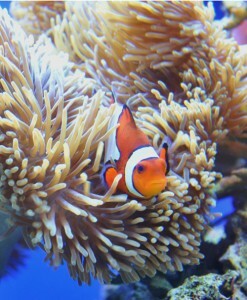 Eighteen percent of Nemo’s closest relatives, the clown- and damselfishes, are threatened with extinction. 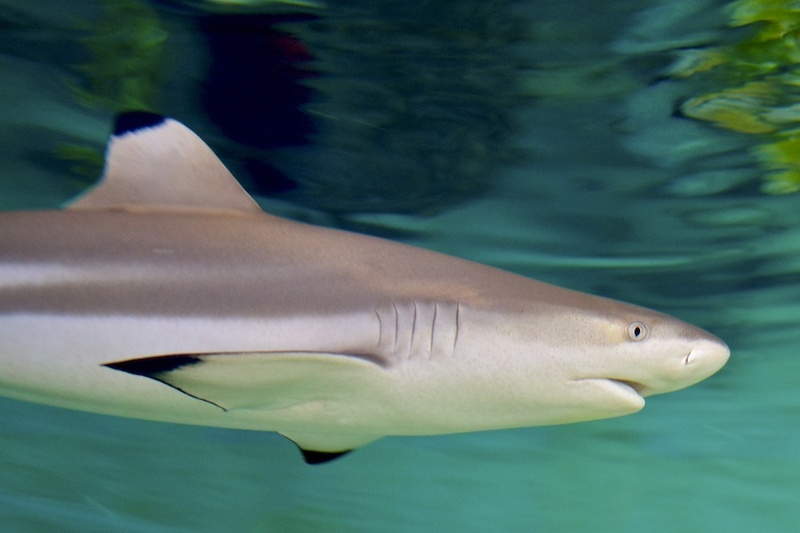 Study authors emphasized the need for more scientific knowledge and international legal protection for sharks and rays. On the brighter side, anemone bleaching did not reduce the numbers of newly hatched and adult clownfish in one study near Australia.7 Breeding programs, like those at Birch Aquarium at Scripps, also help eliminate the need to take fish from reefs by raising anemonefish in captivity and providing them for other aquariums. As scientists and aquarists continue their work, let’s keep one eye on the movie screen and the other looking for intriguing intersections of entertainment and ocean science. You can help support Birch Aquarium’s captive breeding programs of anemonefish, corals, seahorses, sharks, jellyfish, and more! Swim on over to our Adopt-A-Fish page. 2Only 39% of these threatened species are listed on the Appendices of CITES, the most comprehensive treaty agreement to protect species threatened by international trade. Threatened species include those listed under IUCN categories of vulnerable, endangered, or critically endangered. Species lacking sufficient data to determine their extinction risk were assumed to be threatened in the same proportion as species with sufficient information (based on prior work by Hoffmann et al. 2010). 3 Percentage of species threatened: sea turtles (100%), mackerel sharks (80%), hammerhead sharks (57%), eagle rays (50%), and seahorses (43%). What an interesting idea! I’m glad you are willing to shine a conservation light on cartoony cinematic entertainment. Thank you for the thought provoking blog post! Fantastic informative article! I was not aware that extinction-threat for Nemo & his family is so grave! On another note Is Birch Aquarium organizing any event to celebrate the release of Finding Nemo-3D? Beautifully written, Katie! I hope your article as well as others that you have written and will write will help protect our oceans more. Keep up the great work, my dearest friend.